Woo hoo it’s Saturday and in my never ending bid to try and slow down the approach of winter I wanted to share this summery english garden wedding with you all today. Now I am not usually one for pastels but the decor in this wedding is so darn cute. What shocked me the most is that Vicky and Paul created this whole wedding in just 4 months and on a serious budget. The amazing Cake that you are about to feast your eyes on was made by the brides mum, the florals are all handpicked garden flowers and the bunting was so sewn by Vicky’s aunt. We best not forget to mention that the groom played a massive part in this fun-filled budget wedding too, creating his own DIY photobooth and card box. This is one very talented family! “We organised our wedding in about 4 months which was a little bit stressful but can totally be done. We were very lucky that everything just fell into place and we had so much help from friends and family. We didn’t have a huge budget and we were lucky to have our family help out, it made planning more fun trying to be as thrifty and creative as we could be and we managed to pull off an amazing wedding on not a lot. 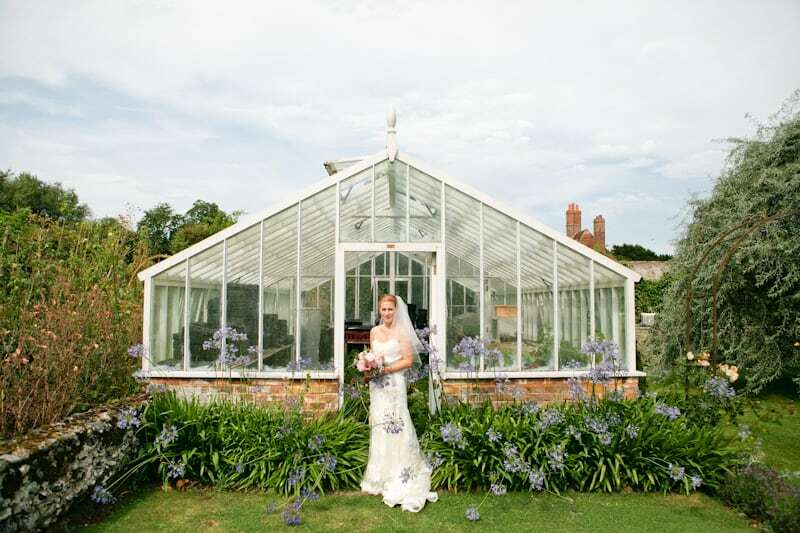 We chose our venue as it is in our home village of Goodnestone which was really important for us, it is beautiful and was just the perfect venue for the vintage country wedding we wanted to have. It was amazing to have the old church right next door to the venue at Goodnestone Park Gardens and the local pub was handy so everyone could have a drink before the I do’s. There is even a secret path from the church into the venues walled gardens where we took everyone after the ceremony to have Pimms & nibbles. We wanted everyone to just relax and enjoy the beautiful gardens while we had our photos taken. Everything was in one place which made it very easy and made the whole day flowed with ease. We hired the whole of Goodnestone Park Gardens and the tea rooms which was perfect for our vintage theme. The venue speaks for itself and hardly had to do anything to make it look amazing and we were so lucky with the weather which shined from the moment we came out of the church. The only bit we had to decorate was the tea rooms where we were having our food & later on the party. We also had a separate bar and space with a 6 x 8 meter marquee which we got off ebay new for £155 (bargain) as to hire was at least 4 times that! The local pub did the bar for us and in fact lots of people from village helped in some way, it felt like a real community affair which made it all the more special. We have a very creative family and were very lucky as everyone helped us out in some way making the whole day more personal. My auntie did all the flowers for the church and venue. We weren’t too bothered about colours, we just wanted a wild country garden style so we used lots of hand picked wild flowers and foliage and it all looked stunning. My mum made the wedding cake and also the fudge for the ladies wedding favours which went down very well. My mother in law made all the bunting from Cath Kidston style material I purchased from Dunelm Mill and must of taken ages as there was about 50 meters!! My best friend Julie did my make up and made me feel like a princess for the day. My sister did my hair which looked stunning. My partner paul, who is a carpenter & joiner, made our gorgeous wedding post box and mr & mrs letters plus a photo booth which was a made to look like a vintage living room. We had pictures of us hanging around and an open frame and props, which was much cheaper than hiring one. I am a graphic designer so I designed everything from the invitations, order of service to the table plan which meant I had total control and all these things really helped save on pennies. Everything else I managed to borrow from friends or get off the Facebook wedding swop shop site which is a must to join if you are planning a wedding. It has everything you might need from local people selling items after their weddings to any help you may need, even services. I also used it afterwards to sell on any bits I didn’t want to keep like my sweets table jars. I really love how family orientated this wedding was, you can really sense the community vibe and its awesome. I want to see more weddings like this pretty please! !